Caz College Pinterest Surpasses 100,000 Followers! After a survey was given out to Cazenovia College students in January 2014, it became apparent that Pinterest was the social media platform most wanted by Cazenovia students. 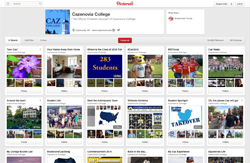 Cazenovia College’s Pinterest page launched four months later on April 7, 2014 with 37 boards. By the end of April, the College received notice from Pinterest that their “Wildcats Athletics” board had been chosen to be featured/recommended for new pinners. This means that when new pinners had the option to select boards they would like to start following, Cazenovia College's board was provided as an option. Pinterest is a virtual pin-board social media platform that allows users to share their favorite places, objects, ideas and more by “pinning” them to boards of their choice. It's also possible for users to search other users’ boards and “pin” this content to their own boards. Around the Town: shows what the town of Cazenovia has to offer outside of campus. The College's Pinterest page also has four Place Pin boards that include a map, making it easy for users to “tag” where an event has happened, where a place is located or where a person has traveled. The Place Pin boards help users visualize where the exact location is of the event, place or topic being pinned. Cazenovia College's Place Pin boards include: "Tour Caz," "Around the Town," "Oh, the Places Caz Will Go" and "Where is the Class of 2018 From?" Kelly Wilson, Cazenovia College's social media coordinator, is thrilled with the positive reception and widespread success of the College's Pinterest page. "It has been so exciting for us to see new followers pinning and liking content from our boards," says Wilson. "We hope to keep improving and adding to our Pinterest page to maintain its success." If you have any comments or suggestions for boards or pins you would like to see on the Cazenovia College Pinterest page, please let the College know by email at cazsocial@cazenovia.edu. Visit http://www.pinterest.com/cazcollege/ to view Cazenovia College's Pinterest page.